Store demos are in new condition, and come with full warranty. Ready for pick-up or shipping. Only two available! 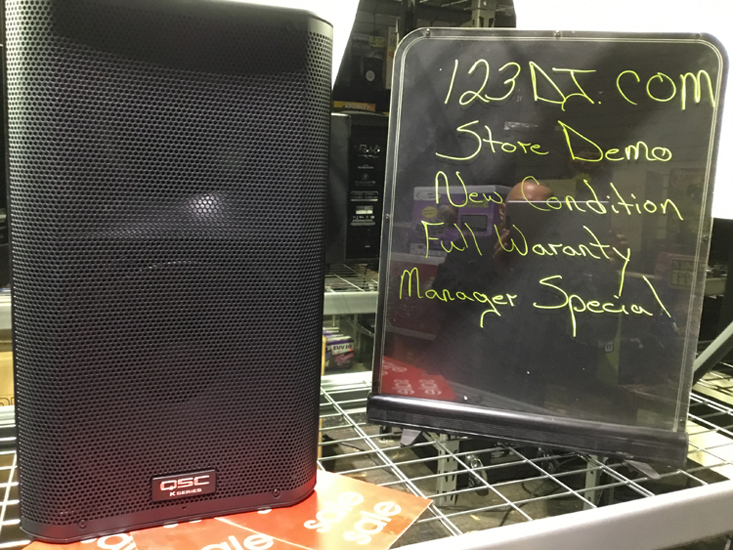 The QSC K12 is a 12" 2-way PA speaker system boasting a 1000W Class-D power module and ~75° horizontal and vertical coverage. Low frequencies extend to ~48Hz (-10dB high acoustic output, 131dB peak). This low-frequency extension makes the QSC K12 an ideal choice for music playback and live reinforcement of instruments, especially in venues where more directional speakers are needed. 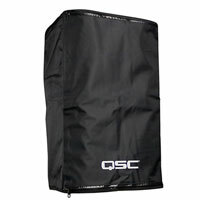 Equally at home in the role of stage monitor, the QSC K12 speaker enclosure has an angled side for use as a low-profile, horizontal wedge and a flat side for proper side-fill use. QSC's K12 PA Speaker features a 1-3/4" HF device in its 2-way enclosure. The primary differentiator in k-series speakers is the resulting output dispersion—the K8 being the widest at 105° and the K12 the narrowest at 75°. This radical approach is achievable due to a process called Directivity Matched Transition (DMT). DMT allows QSC to take advantage of a fundamental law of acoustics: smaller diameter woofers have wider coverage patterns than larger ones. The K Series matches the HF device to the LF dispersion, allowing for the smoothest and flattest frequency response possible across the entire sound field. The K12 speaker boasts other user-friendly features. For example, when the speaker is pole-mounted, the Tilt-Direct pole socket converts to a 7.5° down-tilt with a simple 180° rotation of the dial. A locking IEC power cord is included, preventing accidental disconnect during a performance. For installed applications, connecting a commonly available potentiometer to the unit's Euroblock connector allows the operator to have gain control from a remote location. Multiple K Series units can be daisy-chained together to one centralized control. Additionally, the K Series enters Standby mode after 5 minutes of inactivity, conserving power. The entire QSC K12 package is housed in rugged and sonically friendly ABS (the sub in birch plywood) with steel grilles and carry-friendly ergonomic aluminum handles. The K12 2-way PA speaker may be pole-mounted, suspended, or yoke-mounted. The K12 yoke accessory kit (not included) allows for either horizontal or vertical yoke mounting, providing a flexible means of attaching K-Series loudspeakers to a building structure or truss. When suspended deployment is required, M10 threaded inserts support vertical or horizontal suspension, while the integral pole mount socket accommodates 35mm speaker poles for use on a speaker stand or over a sub. The pole socket is designed so that the speaker may be angled down 7.5° in order to cover the audience while keeping acoustic energy off reflective walls and ceilings.